On this series of post I’ll explain how to setup a high available and redundant NFS cluster using iSCSI with DM-Multipath and Corosync & Pacemaker to manage the cluster and the resources associated. The objective of this scenario it’s create a redundant and fault tolerant NFS storage with automatic failover, to ensure the maximum availability of the NFS exports most of the time. 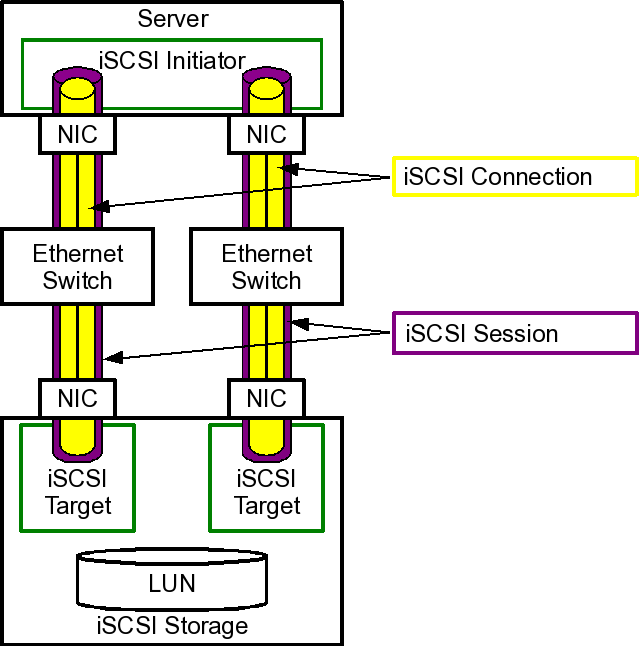 For this environment I’ve used two servers running Ubuntu 14.04.2 LTS with two NICs configured on each server, one to provide the NFS service to the clients and another one to connect with the iSCSI SAN network. For the iSCSI SAN storage device, I’ve already setup two physical adapters and two network interfaces for each adapter for redundant network access and provide two physical paths to the storage system. Both NFS servers will have attached the LUN device using a different InitiatorName and will have setup the device mapper multipathing (DM-Multipath), which allows you to configure multiple I/O paths between server nodes and storage arrays into a single device. These I/O paths are physical SAN connections that can include separate cables, switches, and controllers, so basically It is as if the NFS servers had a single block device. The cluster software used is Corosync and the resource manager Pacemaker, where Pacemaker will be the responsible to assign a VIP (virtual ip address), mount the file system from the block device and starts the nfs service with the specific exports for the clients on the active node of the cluster. In case of failure of the active node of the cluster the resources will be migrated to the passive node and the services will continue to operate as if nothing had happened. So let’s get started with the setup! NOTE: initiator identifiers on both servers are different but they are associated with the same LUN device. In my case /dev/sda is the local disk for the server and /dev/sdb and /dev/sdc corresponds to the iSCSI block devices (one device for each adapter). Now We need to setup a device mapper multipath for these two devices, /dev/sdb and /dev/sdc, so in case one of the adapter fails the LUN device will continue working in our system and multipath will switch the used disk for our block device. Now as you can see we’ve a new block device using the alias setup on the multipath configuration file /dev/mapper/nfs. The disk I’ve partitioned and implemented the filesystem is the block device /dev/mapper/nfs-part1, so you can mount it in your system with the mount utility. This post is a second part of the series of post High available NFS server, find the second part here.